After our visit to sophisticated, metropolitan London, the Best of British Tour moves back to the country as we sample the food of Dorset. Karen at Lavender and Lovage is the generous host for Five go mad in Best of British in Dorset. I have to say that I wasn't really aware of a particular cuisine for Dorset, but on further investigation I found that Dorset Apple Cake seemed to be a specialty. Preheat the oven to 180C/Gas 4. Grease a deep 23-24cm springform cake tin and line with baking paper. Sift the remaining flour and the baking powder into the bowl and fold in with the ground almonds. Add the chopped apple pieces and stir until thoroughly mixed. Spoon into the prepared cake tin, smooth over the top using the back of a spoon. Bake in the oven for 1 hour or until well-risen, brown and a skewer inserted into the centre of the cake comes out clean. If the cake starts to look a little too brown, cover with a sheet of baking paper after about 45 minutes. Leave to cool in the tin. Serve the cake and dredge with extra caster sugar. Cut the cake into generous wedges and serve with clotted cream. I'm not sure if it was this particular recipe or the apples I used, but I found this cake rather bland. In future I would add some cinnamon or other spice to boost the flavour. Then again, I didn't have any clotted cream to serve it with, so maybe that would make the difference. The Best of British Challenge has been organised by Karen Burns Booth of Lavender and Lovage and Fiona McLean of London Unattached. Many thanks to them both for all their hard work and to New World Appliances as proud BRITISH manufacturers of kitchen appliances who are sponsoring this event for the first six months. Now really is the time for apple cake. Adding cinnamon feels right. I made Dorset apple cake once...in Dorset would you believe! I loved it. That is a superb looking apple cake, which I have a particular soft spot for. Going to have to get some apples this weekend and head into the kitchen I think. 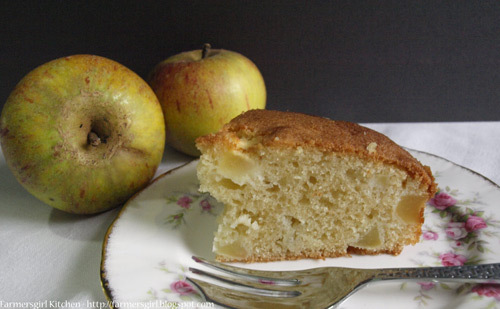 I'm very fond of a bit of apple cake and some of the best I've had were from Dorset. Yours looks lovely but I'm sorry to hear that it seemed bland. Maybe served warm with some clotted cream would have helped. Oh, I do like the sound of this cake - apples and almonds - right up my street! A shame you found it bland - I think I would go with you on wanting to add spice. I often like to used mixed spice as I feel it gives a much more rounded flavour than just cinnamon, which can be overpowering. I do like baking with apples though, in general.